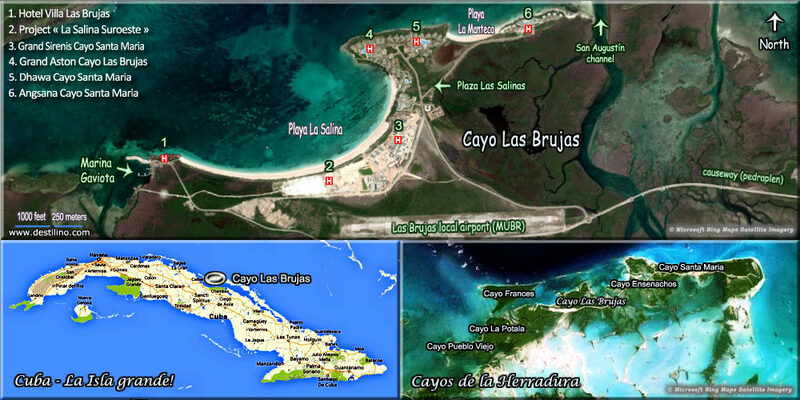 Tourism development started first on Cayo Las Brujas in 1999 with the opening of the first hotel in this region, the Villa Las Brujas. The next hotel to be built was the Sol Cayo Santa Maria (2001), the latter became the first all-inclusive resort in the province of Villa Clara. Find here the detailed chronology of tourism development in the Cayos of Villa Clara. 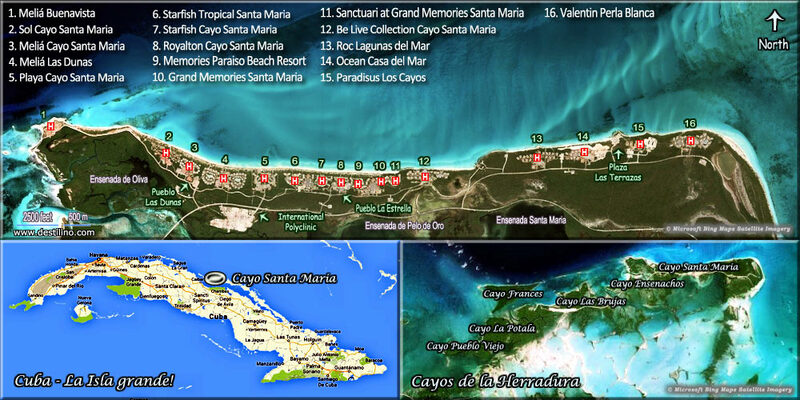 Every hotel on Cayo Santa Maria is resort-style and All-Inclusive (meals, snacks, drinks, daily activities, evening entertainment, non-motorized water sports). Every property (buildings and services) belong to the government-owned "Grupo Gaviota", however joint ventures and administration contracts are awarded to several international hotel chains (such as Melia, Blue Diamond, Valentin, H10, Iberostar and Banyan Tree) to manage and promote many of these hotels. In Cayo Santa Maria, every hotel is located along its northern coast, while the southern areas are mainly covered by marshes and mangroves. The hotels are all oceanfront but have been built a little back behind the dunes; the beaches are accessible via several raised footbridge for a minimum impact on the dunes' flora and fauna. The dunes also serve as a natural protection against hurricanes, thus minimizing damages to hotels. There's another all-inclusive resort, the Iberostar Ensenachos (formerly Occidental Royal Hideaway), on the neighbor island of Cayo Ensenachos. It's a one-island/one-resort concept, this hotel used to be adult-only during the Occidental administration, it's now for everyone. On the other island of the area, Cayo Las Brujas, there was for many years only one small eco-hotel called Villa Las Brujas, located on the gorgeous Playa Salina beach. But Cayo Las Brujas is currently undergoing an extensive tourism development with five new all-inclusive resorts, a commercial center and a boutique hotel totaling more than 2,700 rooms. Click the thumbnail to view a chart of the number of rooms per hotel. The size of the hotels vary from 24 up to more than 1,000 rooms. Most of them cater to everyone, couples, families and singles; but there are also a few of them which are adult-only properties, such as: Melia Buenavista, Royalton Cayo Santa Maria, Sanctuary at Grand Memories Santa Maria and Valentin Perla Blanca. During our first trip to Cayo Santa Maria in January 2002, when the Sol Cayo Santa Maria was the sole hotel on a desert island, we were told about the project to build more than 10,000 hotel-rooms in the area in the next 10 years or so. It was very hard to believe back then, but they achieved this goal, and will even surpass it! 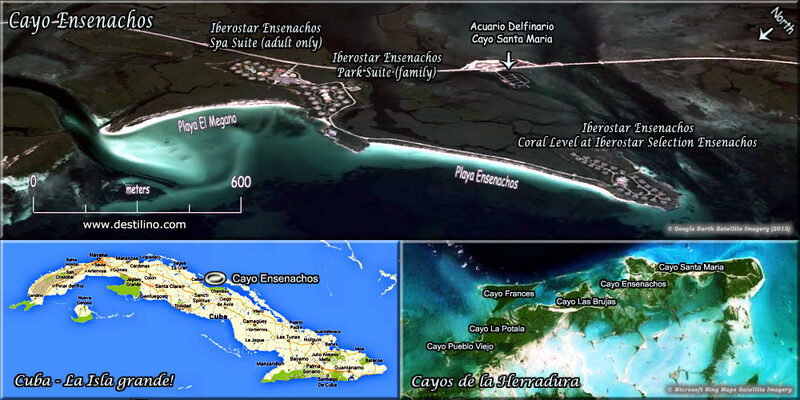 It is expected that the sprawling development of the total "Jardines del Rey" (King's Gardens) archipelago, which includes the following islands: Cayo Santa Maria, Cayo Las Brujas, Cayo Ensenachos, Cayo Coco, Cayo Guillermo, Cayo Paredon Grande, Cayo Cruz, Cayo Sabinal, etc., should eventually include more than 32,000 hotel-rooms. Visit also the King's Garden Islands section of our website to learn more about the other destinations (cayos) of this vast archipelago.